As in a previous post regarding my 30's retro Dresden Plate quilt top, I am now in the process of making appliqué flowers, vines and leaves for my border. I have gone through all my quilting magazines looking for different type flowers. It seems like every magazine has the same pedal flower appliqué design. I am really wanting some variety of flowers in my borders. Can any of you recommend a overall good appliqué book to purchase that night have a variety of flower designs? 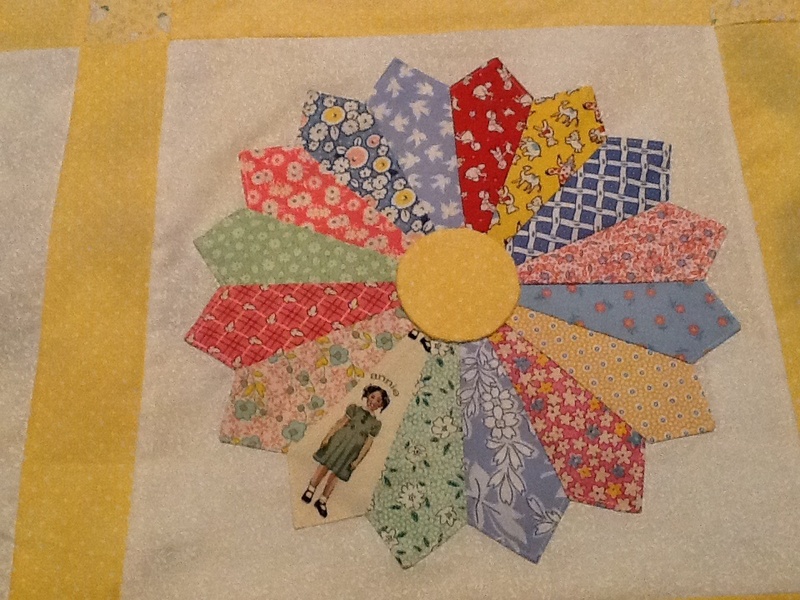 I have attached two pictures, one of my quilt block and the other showing some of my appliqué flowers. Any comments or suggestions would be gratefully appreciated. Don't know any but am looking forward to seeing finished quilt! One of my favorites is to cut 4 small hearts, arrange in a circle like flower petals, and cover the points of the hearts with a small circle. Makes really cute flowers!! Google images of "flower coloring pages" you should get tons of ideas. Also "flower tattoo flash"
I love the 1930's tulip patterns that so many quilts used. They are very easy to draw and applique. Just Google "1930's tulip quilts" and click images. You will see dozens of varieties. I'm sure you will find one that will work with your design. This is so special! Love it. As far as a suggestion on a great book for flowers, I recommend "Applique" The basics and beyond. by Janet Pittman. What a nice book and many lovely designs to use in it. I think I got mine on amazon. I google searched and Walmart has it much cheaper than anyone on line. Last edited by RedGarnet222; 08-01-2013 at 08:44 AM. I think those flowers are so cute!! Love the fabrics and the shape. Love your dresdan and the flowers. What do you think about adding buttons as the center of the flowers - I love buttons and they would withstand use. I also like the idea of making little hearts for flower petals, I've seen that before and they are adorable. Hurry! Can't wait to see the finished quilt! Magic Vine from Quilt in a Day has a variety of detailed appliqué flowers and the quilt is her version of a 1930's pattern. You could do yoyo's in the center of your flowers. Very pretty, be sure to post a picture of your finished quilt. I have to reiterate Feathers n fur suggestion...the flowers in the Magic Vine book are copies of flowers that were published in the 1930's in Newspapers so it is so absolutely appropriate for this quilt. BTW...loved the fussy cutting on your dresden...its adorable!! Just put quilt flower applique in your search engine and you will be amazed how many you find. 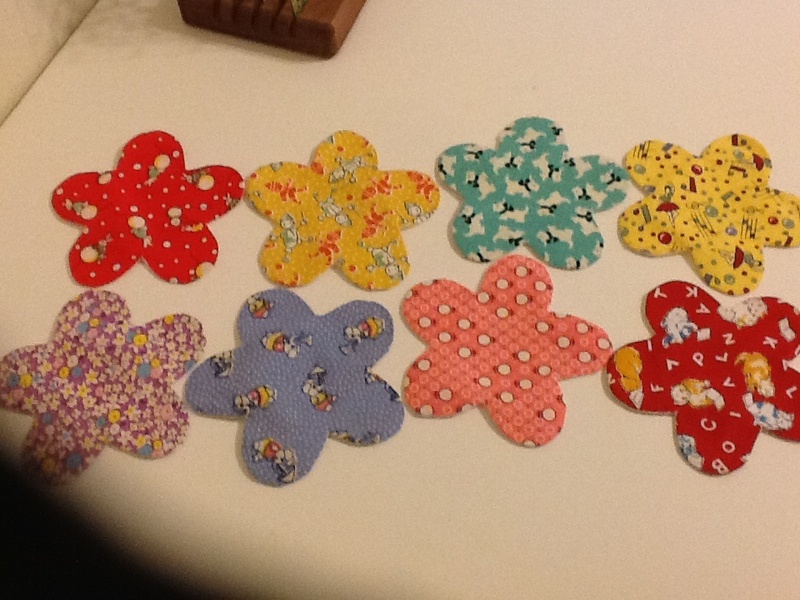 What about hexi flowers? The paper pieces come in all sizes starting at 1/2 inch on up to in excess of 3". You don't even have to baste them now....just use a glue stick and do one side at a time.....works great. I love your flowers. Why not just embroider a good sized circle of french knots and then fill in that circle with the knots. Old fashioned, easy and effective. 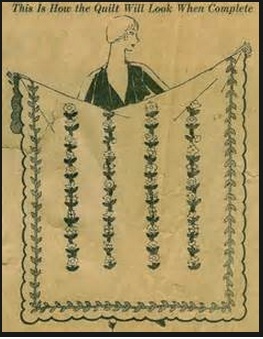 Try looking at some of the Aunt Martha's embroidery designs. They have a lot of neat retro designs. Not long ago there was a discussion on this board about folded flower applique and I saved some of those links. You may not want to go into such detail or have your border so heavy, but at least there are ideas here. Several years ago I saw a quilt made by a lady from Japan which used miniature Dresden plates in the border! That was absolutely gorgeous! Hydrangea Avatar, so many of you have asked for. They are beautiful, aren't they! Here is another tutorial with templates for other folded flowers, but McAfee says the site is not OK. You be the judge. I understand that YouTube has tons of tutorials if you want to check out those. Sorry, I meant to suggest a circle of filled in french knots in the middle of the flowers that you made. As others have mentioned, you can go to GOOGLE, select "Images" and then do a search. If you type in "floral design" (without the quotes), you will get a lot of swirls and stems and leaves as well as some flowers. If you search for "flower design" then you will get some different images, including flower heads. Look for "flower applique" and get a bunch of ideas as well. Play around in Google Images and you will end up with many ideas and images to use. Have fun!